The hallucinatory effect of the mescaline cacti makes the world look a bit more colorful. This LSD-like, natural triplicate of South American origin is still used by Indians such as the Native American Church. Effects are light sensitivity, through which people and things shine and you feel love for everything. With us you can go to the most famous mescaline cacti: San Pedro and Peyote. 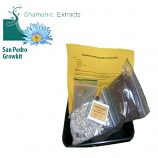 In pot, cutting or loose seeds. 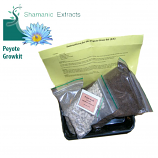 These growkits are a complete tool to grow your own mescaline cacti at home.